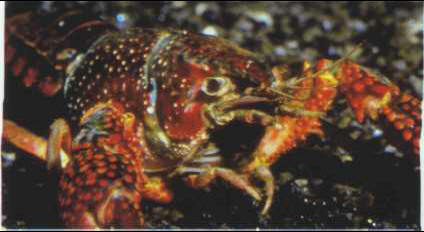 One crawfish, Procamburus darkii, the Louisiana crawfish, has been imported by a number of countries. It can cause a great deal of damage as it is fossorial and burrows in river banks. It grows quickly (starting to reproduce at the age of 7 or 8 months) and is highly adaptable, as it tolerates a wide range of temperatures and requires little oxygen. Many of the imported specimens come from South-East Asia, where there are red and blue varieties. It is omnivorous and can attack plants and fish, as well as other crustaceans. It is therefore best to keep a single specimen, even if the aquarium is very big and endowed with hiding places. Size: 15 cm. ХИТРУК Федор Савельевич (р . 1917), российский кинорежиссер, художник, народный артист СССР (1987). Поставил мультфильмы: "История одного преступления" (1962), "Каникулы Бонифация" (1965), "Фильм, фильм, фильм..." (1968), "Остров" (1973), "Дарю тебе звезду" (1979), "Лев и бык" (1983) и др. Государственная СССР (1976, 1982).